When putting together your outfit for a business meeting, date, or other important occasions, there are a lot of little aspects that you’ll have to take into consideration. From what color tie to choose to how you should lace up your shoes, there always seems to be another thing to figure out. One aspect, in particular, can be difficult to learn, and that is how to match dress socks to your shoes and pants. Many men stick to the basic colors, such as black or navy, to avoid needing to make this choice. However, it can still be hard to know what color to wear when your shoes and slacks are not the same color. What is it then that you should know about matching your socks to your outfit when dressing up? Today, we’ll help you find out. First, start with a few basic rules to help ensure that you don’t choose any socks that are completely unacceptable for your outfit. In 99 out of 100 cases, white socks won’t be the right choice for your outfit. Sure, white socks have their place like any other kind of socks, but they aren’t the right choice for wearing with slacks and dress shoes. There may be some unique exceptions, but for now, it’s good to avoid white socks while you’re learning about what socks to wear. 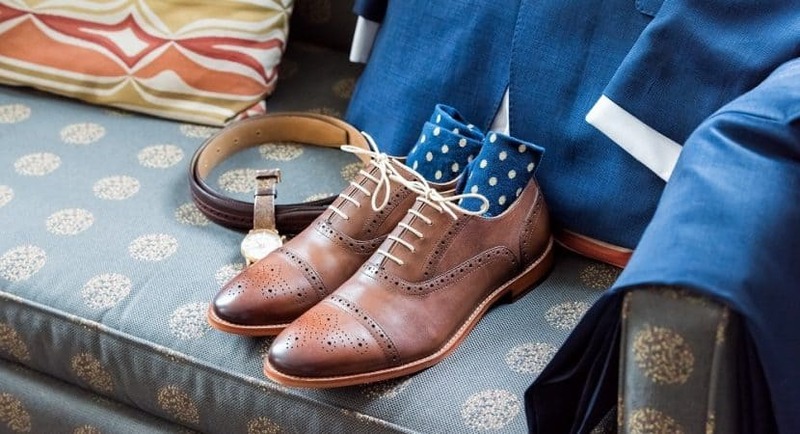 For most formal occasions, you’ll want to choose socks that come over the calf or even higher. This type of socks will give a more professional and sleeker appearance because your ankles won’t be peeking out. Rather than trying to match your dress socks to your shoes like most people assume they should do, you’ll actually find more success when dressing up with a nice pair of slacks and shoes if you match the socks to the pants instead of matching the socks to the shoes. Let’s break down what this means in practice. With solid pants, choose a patterned pair of socks or solid socks of a contrasting color. If you wear a pair of solid socks that is close to the color as the pants, even a subtle difference in tone will cause you to look messy. If you find an exact match to the pants, your body’s proportions may be a bit unbalanced because there is no break in the color. Instead, you want to choose something that will add a bit of visual interest to your ankle while also separating the ankle from the leg. Choosing a contrasting solid color or a complementary patterned design will help you have a sleek and finished look. When you’re wearing patterned pants, this is a great time to wear a solid pair of socks in a matching color. By doing this, you can elongate your legs. This is important when wearing patterns as they can cause you to look disproportionate or bottom heavy when not styled properly. If you have brown patterned pants, for example, you can wear a pair of solid brown socks. The solid socks break up the pants and separate them from the shoes, giving a nice distinct line to the look. These lines are everything when creating a great profile. The rules of which socks to wear can change depending on what type of event or setting you’re getting ready to participate in. Some socks just aren’t appropriate for certain situations, so you want to keep the context in which you’ll be wearing the socks in on your mind when you go to choose them. If you are going to a very formal or black tie event, you don’t want to wear bold or bright patterns. Instead, choose subdued colors and patterns that are made from high-quality materials. If your office is a stickler for sticking to a conservative dress code, you will also want to stick to subdued patterns and colors during regular business hours. Break out the bold patterns and colors during happy hour or on casual Fridays at the office. As you can see, it’s essential that you have the right socks for the occasion. Even if you think your socks will never be noticed, they will be, so choose them wisely! You never know when you’ll sit down unexpectedly and allow a peak of your socks to be seen by everyone. When you’re an adult dressing for the office or other important events, it’s time to let go of the gimmicky socks. This means leaving the socks covered in pizza, guitars, or beer at home when you head to work. Sure, themed socks can be fun for some specific special occasions but wearing them daily can be seen as unprofessional and juvenile. It’s fine to wear something with patterns on it or in a bold color, but you don’t want to choose something that is too busy or immature for your age, position, or workplace. Consider how much socks should show with your outfit. If you show too much of the socks, it might look a bit messy or even too young for your appearance. There is a time and a place for crop cut slacks that show off a lot of your socks. Choose that time wisely. At other times, stick to a more standard approach to the height of your socks and the length of your pants. When you’re standing, most men find that they want their pants to touch the top of their shoes. This means that you wouldn’t always see your socks, but they will be visible in different situations as you go about your day. The final rule that you need to learn when figuring out how to match dress socks to your outfit for any occasion is to have fun with the composition! Picking out your socks doesn’t need to be boring or restricted to the basic colors of grey, blue, and black. Instead, you can use those fun patterns and colors that you love most! Many men do not consider contrasting colors as their first choice for a socks option, but they can be worn with great style when done confidently. What will you choose?